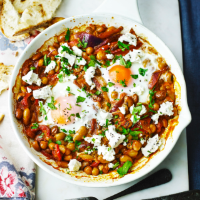 Gorgeously sticky beans with soft, runny eggs and a crumbling of salty feta. Guaranteed to impress. 1. Preheat the oven to 200˚C, gas mark 6. Heat the oil in an ovenproof frying pan set over a medium heat. Add the onion and cook for 7-8 minutes, until starting to soften. Add the roasted peppers, paprika, sugar and a good pinch of salt, then cook, stirring regularly, for a further 2 minutes. Stir in the tomatoes, vinegar and mixed beans, then simmer for 5 minutes, until thickened and sticky. 2. With a wooden spoon, make 2 wells in the beans and break an egg into each. Season and bake in the oven for 8-10 minutes, until the whites are set but the yolks are still runny. Scatter over the feta and parsley and serve, with toasted sourdough, if liked. This recipe was first published in Sun Feb 01 12:58:58 GMT 2015.